Some of you may ask, what’s all this Key, KeyKeg, and Cask thing about. 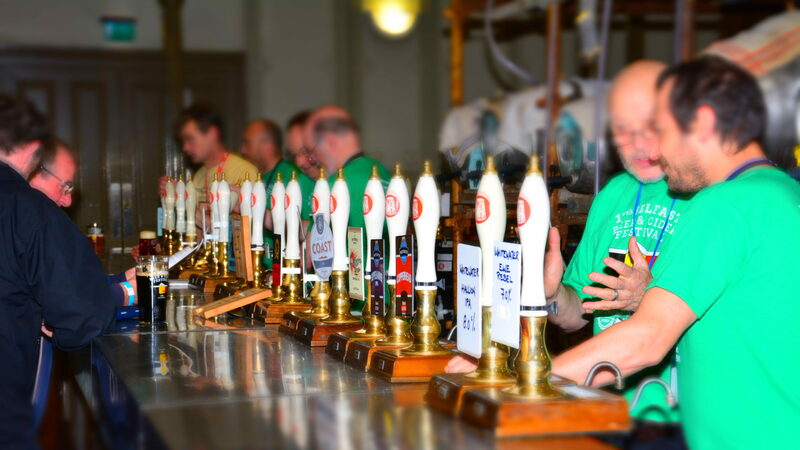 When CAMRA was first founded more than 45 years ago, the only source of tasty, interesting beer was Cask “Real Ale”, and it was rapidly disappearing from pubs across the UK & Ireland, to be replaced by bland beer mostly served out of Kegs. CAMRA’s primary aim was, and always has been to promote great beer in great pubs, and at the time this was done by supporting and promoting Cask Real Ale. In recent years the beer scene across the UK and Ireland has undergone a revolution with many new and interesting brewers and beers. Some of these beers do not fall inside the traditional definition of Real Ale, but we feel still deserve the promotion and support of CAMRA, as part of its campaign for improving the quality of beer available in Northern Ireland and across the UK. The traditional method of distributing and serving beer. When beer is put into a cask, it is put in with yeast, and some food (sugars) for the yeast. Any carbonation in the beer served should be produced by the fermentation of this yeast whilst it’s in the container. The yeast and hops left suspended in the beer are left to settle to the bottom of the cask. To serve the beer, a whole is opened on the side of the cask to allow air in, and the beer is simply poured out of the end of the cask under gravity. If the cask is below the bar (as in most bar cellars), it is pulled up using a hand pump. Because the beer is then open to the air, it only keeps for a few days before spoiling. This traditional method often delivers beer which is less carbonated than newer methods. A more recent invention. In kegs pressurised gas is used to force the beer out of the keg and up the beer line towards a tap used to serve to the customer. In order to get the beer (which sits at the bottom of the keg out) a metal tube is run from the fixing at the top to the bottom of the keg. 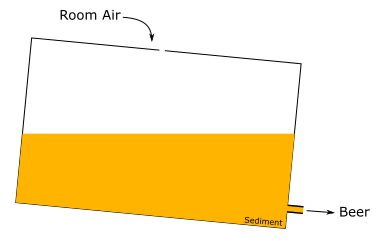 Because of this the beer needs to be filtered and clear before entering the keg, because any sediment settling at the bottom of the keg would be drawn out of the keg with the beer. Because the pressurised gas is in contact with the beer, it can introduce extra carbonation if the bar serving it doesn’t use the correct gas pressure for the beer. Keg beers tend to be more carbonated than cask. A relatively new adaptation to the Keg system. 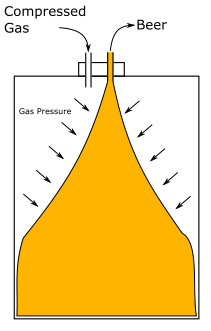 A KeyKeg consists of a rigid outer container inside which a plastic bag is inserted. The plastic bag is filled with the beer. 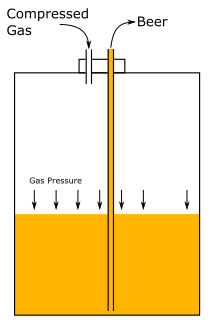 The compressed gas into the KeyKeg is fed into the space between the outer rigid wall, and the inner plastic bag. This means that unlike in a normal keg the compressed gas never comes into contact with the beer, and cannot therefore introduce any extra carbonation. This allows the brewer to control how carbonated each beer is when it is served. Because the beer is squeezed out of the top of the bag, sediment can be left to settle to the bottom, so it also allows brewers to use the fermentation of yeast in the KeyKeg to carbonate the beer. If the brewer does this, then the beer is technically Real Ale, despite being dispensed from a Keg tap in a bar!